Yet the words “Pippi Longstocking” gets nary a mention in a movie loosely based on the author’s early life. Co-writer and director Pernille Fischer Christensen bookends her charmer of a movie with the author, now an elderly woman receiving sacks upon sacks of mail from youngsters everywhere, many of whom ask the key question, “How do you write so well about childhood when you’re are not yourself a child? How can you write about PippI, monkey, horse, Tommy and Annika? What comes across in “Becoming Astrid” is that by the time the movie wraps up, you have a good idea of the experiences she has from age 16 to about age 23, the hardships faced, all fueling her vivid imagination. Her books enjoy the popularity of those written by Theodor Seuss Geisel. She’s a Dr. Seuss on the loose. Ms. Christensen may be best known for “A Soap,” hardly as conventional a movie as her latest, as the 2006 film deals with the relationship of the owner of a beauty clinic and a transgender woman. Now she takes a break and goes conventional, tackling her subject in strict chronological order from ages sixteen to about twenty-three. That should appear to a wider audience rather than the small arthouse crowd that indies often have to accept. Not that this is a sentimental, Hallmark-type film, considering what happens to the principal subject, Astrid Lindgren (Alba August), despite spending her youthful days with religious parents Marie (Trine Dyrholm) and Samuel (Magnus Krepper) and listening to Sunday sermons of Sodom and Gomorrah. 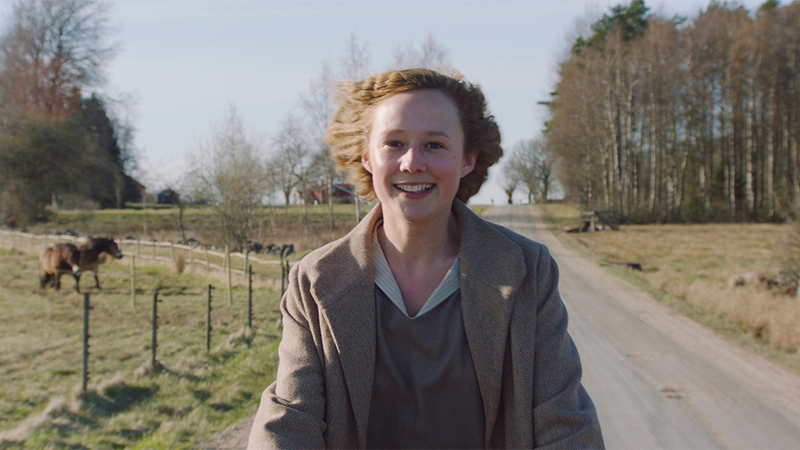 Under Erik Molberg Hansen’s lensing, we get the feel of the life in a small farming village in the Sweden of the twenties where Astrid begins to display the unconventional behavior of her favorite character Pippi. Bored with the Saturday night dancing and from the exhausting work on the small farm, she is discovered by Reinhold (Henrik Rafaelsen), a newspaper editor who has read some of her essays and hires her to intern on the paper. Instead of settling for routine, she branches out with articles of her own and falls under the influence of fashion magazines. She has the barber cut her braids and becomes a thoroughly modern Astrid. The editor becomes more than a boss, falling in love with her despite an age difference of some twenty years, and gets her pregnant despite his promise to be careful. Abortion in freewheeling Sweden did not become legal until 1938, leaving the young woman without quite the dilemma. To avoid the censure of her whole family by the locals, she goes to Copenhagen by train where she lucks out by finding one Marie (Trine Dyrholm), who takes care of the babies of women like Astrid. Though Astrid could take the easy way out by accepting the father’s marriage proposal, she refuses his entreaties and develops the strength that even nowadays could label her a liberated woman. It’s not that anyone who makes strong choices is able to write children’s books. The problems faced by Astrid might appear resolved, as she had the option of leaving Lasse, the child—played by Sigrid af Ekström at three weeks of age, Ludvig V Görensson at six months, and an already accomplished performer, Marius Damslev, at three years. None of these experiences really explain how the woman who would become Astrid Lindberg became such a popular writer, so maybe we should forget about Pippi Longstocking and not worry about the fictional changes the director and writers make. This is an involving enough tale brought nicely up to date as in 1987, Astrid (Maria Fahl Vikander) makes room in her home for the sacks of mail from appreciative kids whose missives are in plain envelopes and in sturdy wrappings alike. Those of us born before the digital revolution might wonder whether such hero worship of a writer of children’s books could ever come to pass in 2018. But take a look at any Barnes and Noble store, go to the children’s section, and you’ll find young mothers sitting on the carpet with their small fry as though they are monitor-hating intellectuals who keep reading and books alive in the marvelous sci-fi picture “Fahrenheit 451.” In Swedish and Danish with English subtitles.